Last Thursday, January 12, 2012, Superman himself landed in Chicago. Geoffrey Canada is the founder of the Harlem Children’s Zone (HCZ) in New York City, star of the pro-charter, edu-documentary "Waiting for Superman", and guest on shows like 60 minutes, NBC’s Education Nation, CNN, and even Oprah (before she left the airwaves). Canada gave the keynote address to a group of hundreds in Rockefeller Chapel at the University of Chicago as part of an event celebrating Dr. Martin Luther King, Jr..
Harlem Children's Zone CEO Geoffrey Canada (above, second from left) has parlayed his narrative into a lucrative career attacking public education, unions, and public school teachers on behalf of corporate America and its leaders. 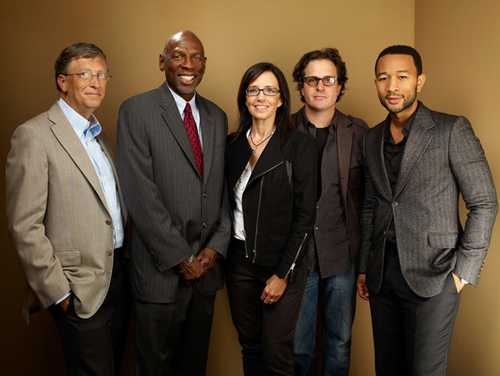 Above, Canada stands with billionaire Bill Gates (left) and the producers of the teacher bashing movie "Waiting for Superman" in Toronto in October 2010. Canada was a charismatic speaker who had the audience laughing and nodding along for much of his address. He spoke of himself as a “social justice guy” who is convinced that “if our country continues to treat the children of this country the way we do, we will destroy this country.” He angrily cited statistics about how America incarcerates more people than any other country on the planet, disproportionately affecting Black and Latino youth. He spoke out against food companies that contribute to the poor health of our nation’s children in the name of profit. “Seventy-five percent of kids in the U.S. do not qualify for the military,” he said, due to being so overweight and out of shape they cannot pass the military entrance requirements. He stormed on about how “children are vessels for commerce” as companies sell them soda and food so bad for them they have become physically ill.
Canada spoke powerfully on many of the very real obstacles standing in the way of success for too many of our nation’s youth and their families. He lamented about the corporate greed which has created these problems by preying on the children. And then he started to talk about education. For some inexplicable reason, the same man who railed against corporate greed making kids overweight and throwing them into the lucrative prison system sees no problem joining profit-mongering corporate education reformers. Canada fully embraces the market-based, semi-private charter school model. Canada’s string of charter schools in NYC takes public money in combination with the many millions Canada raises from the rich and powerful. A bona-fide 1%er himself, Canada justified his wealth saying in order to raise funds he needed to “do what rich people do” and “hang out with rich people”. He has allowed the worship of test scores to run his schools as they are the prime marketing tool to collect more revenue (and by revenue, I mean students). In order to get those stellar test scores, the HCZ Promise Academies, like so many other charter schools, place a strong emphasis on test prep and skill building and push poorer-performing children out of their schools. In fact, the very first cohort of children coming through the middle school had such poor scores that the board decided to kick them all out. The HCZ advertises its schools all over the city, unlike the neighborhood schools which do not have the funds to “compete” this way. His schools spend nearly three times as much per-pupil as the nearby neighborhood school, yet he unabashedly claims it is the great teaching alone which makes all the difference, again as a way to market the schools. The schools are sometimes co-located with neighborhood schools and HCZ flaunts their new books, new computers, and small class sizes in front of the kids who were not “chosen” and have nothing. In addition, they take on fewer of the hardest to educate (and therefore most expensive) students like children with special needs and English Language learners as they simultaneously take away public funding from those neighborhood school kids who need it the most. I believe Dr. King spoke about equality for ALL, not the few picked to receive extra funding and resources by some lottery. Canada points out the embarrassing incarceration rates among Black and Latino males and then chooses to run his schools like tiny prisons with little room for creativity, play, or the home culture of its students. They sometimes have up to five adults in one classroom, thanks to the extra revenue they receive from outside sources. The philanthropy that supports his schools is collected in part by his charisma and connections, a model which is neither sustainable nor replicable for other schools to follow. His non-unionized labor force experience poorer working conditions and often lower wages as he burns through staff at a far higher attrition rate than nearby neighborhood schools. From the very pulpit Dr. King himself once stood, a man who was a staunch supporter of unions and labor rights, Geoffrey Canada began his favorite, well-rehearsed rant on teachers and their unions. He roared about “accountability” saying “Teachers, if you can’t teach, you should get another job” prompting one of the biggest applause lines of the night. After pointing out all the troubles ailing children including poverty, sickness, and exploitation by the rich and powerful, he unapologetically talked about the adults “making excuses” for failure, but only in reference to teachers! He never once mentions his rich, corporate friends and donors when talking about education. The well-documented unequal school funding systems, especially at the state and local levels, were not discussed once. 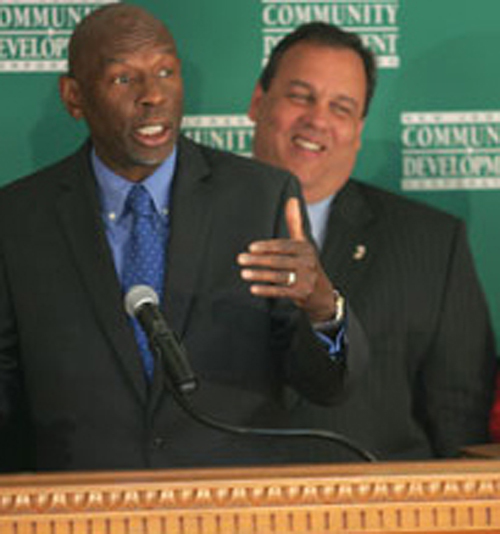 Geoffrey Canada has allied himself with the nation's anti-union corporate leaders and with some of the most reactionary political and cultural leaders of the 21st Century. Above, Canada with New Jersey Governor Chris Christie.While he pours money into his schools, he refused to acknowledge the role money plays in education. According to Canada, teachers and teachers alone are the problem. Oh, and in education, corporations are our friends. While the HCZ has provided real relief for many families living in dire conditions, an action which should be applauded, I cannot reconcile this noble mission with the use of the corporate-backed charter school model. Even the NAACP has released a statement rejecting charter schools. Canada’s distain for unions, the abuse of his non-unionized work force, his justification of raising funds for some children at the expense of others, his decision to treat children like prisoners with rigid “zero tolerance” discipline policies, and his alignment with the very corporate forces who would destroy public education and its promise of equitable free quality education for all, are all in direct opposition to what Dr. King actually preached. The University of Chicago should be ashamed to hold an event like this in the name of Dr. King. Then again, perhaps it was fitting having the poster boy of corporate education reform speak at the very University which birthed many of the most destructive neoliberal policies decimating first our economy and now our education system. Superman, your type of saving is not wanted in Chicago. [Editor's Note: We are still waiting to get a copy of the video of Canada's University of Chicago speech. But Geoffrey Canada has a kind of stump speech that you can hear anytime he is speaking, and much of the report above summarizes it. Basically, the speech involves an old salesman's trick. Identify a problem and then "solve" it with your product. Geoffrey Canada is solving the problems of segregation and unequal education of the 1950s and 1960s by ignoring the real problems of the 2000s and 2010s — and by attacking teachers and unions and pushing corporations and privatization. One of the best videos that give Canada at his peak was made in July 2010 during the "Aspen Ideas Festival" (the same event that featured Jonah Edelman bragging about how Stand for Children outfoxed and outspent the Chicago Teachers Union during the fight over SB 7 in the Illinois legislature). Canada and Roland Fryer, a professor of economics at Harvard University, did a panel that last almost an hour, and it's as quick a way as any to get the same information Canada presented at the University of Chicago in January 2012. The URL is: http://www.good.is/post/geoffrey-canada-some-teachers-can-t-teach/].